A few weeks back I put my intention out to open a Beacon Collaboratory, or what I called in the blog post a “Superhero School.” As I look around me, I’m seeing a pattern of convergence towards these kinds of live/work/play spaces. As “living labs,” these spaces bring together elements of a tech incubator, an R&D facility, a hackerspace/fablab, a sustainability demonstration site, and it’s all tied to place – with the projects / prototypes / experiments being done there carried out and implemented in the local area, stimulating the economy, creating jobs, and building resilient communities throughout the area and the region. I’ve been over to the dream property four times now, and each time I go it seems I have a clearer sense of how the whole thing could work. I can see it as being an innovation hub and retreat center, wrapped in a creative learning culture. Just 90 minutes by train from NYC, a welcome change of scenery for Silicon Alley. As ‘collaboratory’ is defined as a “center without walls,” it could be a second home to a lot of different change agent organizations. For instance, Hub could have a presence there, COMMON could launch some socially conscious enterprises there, Open Source Ecology might build some equipment there, and a hacker collective could run a bootcamp there. There could be programs for teaching kids to code, mentorships with high school students to guide them from idea incubation to entrepreneurship, and events around any number of topics, like arts and culture, technology, business, sustainability, or spirituality. At any rate, I wanted to do a bit of a deep dive to find existing examples of these types of things around the world, and was pleasantly surprised to find hundreds. Below is the rest of the rabbit hole I fell down all afternoon. Enjoy! Happy New Year to you Venessa! Can I also propose http://www.giordanobrunouniversity.com and http://www.unltd.org.uk/ and http://thefinancelab.org and http://tastingthefuture.ning.com/ for your list! thank you lucy for the great links! Thanks for including us Vanessa! There´s a lot more to come soon from Berlin, I´ll keep you posted. Thanks a lot for your research work and this great resource! thanks dominik. i was impressed by jay’s piratepad and how much is already going on in berlin! whoa. that’s a lot of gold you just dished up..
huge thanks to all of you. will be referencing..
Fine work here….I respect your focus so much. What concatenation do you see in this research with new learning ecologies for early age…. (5yr to 18yr old). Learning communities for the young in public spaces are an ultimate elephant in the room of the P2P/participatory culture/futures thinking movement. As ideology is born upon the shared indoctrination of school, young people should be a concern of all progressive thinkers today…. Your work is fascinating and powerful Vanessa. Thank you. i was sitting with my 6 year old niece the other day at the table, and she was telling me how she wanted to self-publish a book online for other kids. she grabbed my iphone and went into the calculator and after a few minutes informed me that if she could sell 125 books at $8, she could buy her own iPad. (she thinks iPads cost $1,000). so, these are the kinds of people we are raising these days! if she’s this entrepreneurial at 6, what is she going to be at 12? 20? 30? i mean… this is just the stuff that excites *me*…. and now watching my nieces and nephews at ages 3-6, it’s what excites them too. they are still in the fantasy & play phase… this feels like a game for them. and it is, and can continue to be. but serious games, that actually get you paid and teach you thinks that you apply in the real world. it’s just all so exciting. THIS IS SO TOTALLY FANTASTIC! Venessa, you rock. I am also a collector and aggregator/sharer of resources (e.g. this doc here https://docs.google.com/document/edit?id=1uSbfCbZg5_tjKWJYNV38SrYdZrlbgrO8R7E866Iw3uA&hl=en)…but this just blew me away. I’m a little dubious about the idea of people schlepping to a “retreat” location – creates sales and scheduling overhead. Thanks for putting this together, its very useful. I’ll be using it on http://www.hackinghealth.ca! Thanks for this Venessa, it’s really useful. hi, Are there any such places or Co-op groups in India. and two incubators for sustainable startups : a) make a cube http://www.makeacube.com/english/ in milan and b) dnamo http://www.dnamo.nl/en/ in rotterdam. also the unreasonable institute http://unreasonableinstitute.org/ in colorado is something to look at. Well, thank you. Had this post cooking and glad it was not ready, adding your list helps me make a point. 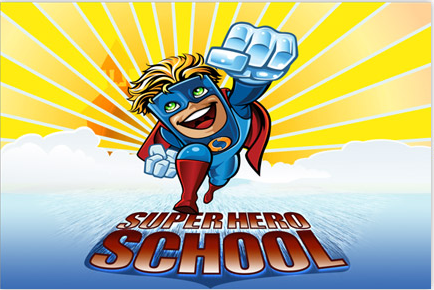 Amazing to see there are so many “Superhero” schools. Our Centre is in Uganda and is a hub for teenage social entrepreneur development. Our Centre blog is at http://chrysalisuganda.wordpress.com – we’re small but we’re relevant and high impact. How can Hyper Island not be on this list! Great list. Can I add our incubator for charities – to help them develop revenue generating digital products. Sidekick School (sidekickschool.net). Funny you should mention Super Heroes… Here is a little video we have recently made to inspire #generosity. We asked people to tell us “If I was a SuperHero I would…” and there were some interesting answers…. Venessa, you could also add Kufunda Learning Village in Zimbabwe, near Harare to your list. There are more that fit in the category Living Labs, check the Berkana Exchange for more. Venessa, saw your mega list briefly in January and coming back to it again now. Huge thanks for putting this together! Hey this a rather facinating list! I recently worked with a group collaborating with Team Akademi, from Mondragon University, Spain. Great brainstorming workshop on Social Innovation.